Two simply superb antique hand towels home spun of a fine and deliciously nubby weave of ecru linen and hemp. 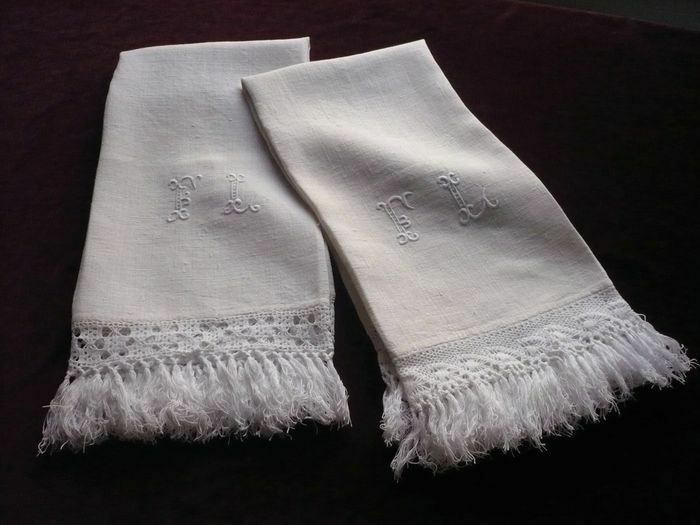 These charming towels are embroidered at one extremity with an elegant, architectural monogram, "FL," stitched in a slightly contrasting white pearl thread, and are bordered at each extremity with a thick brush of rustic bobbin lace and silky fringe. Each towel has a slightly different style of bobbin lace but they are otherwise identical. Likely dating from the turn of the 20th century this delightful pair of towels is a rare find, in as-new condition and showing only a slight difference in hue, probably indicating that one had seen fewer launderings than the other. Dimensions: 36 x 25in.